Ingredients: Bee pollen directly from beekeeper. Nutrition: Per 100g. Energy 1179kj/282kcal. Carbohydrates 41.1g. Fat 5.9g (saturated 0.7g). Protein 15.9g. Salt 0.13g. 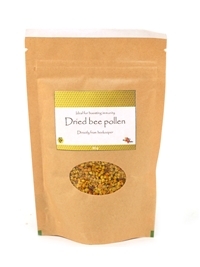 Bee pollen is wonderful for natural allergy relief and is responsible for the many health benefits of raw honey. It’s rich in vitamins, minerals, proteins, lipids and fatty acids, enzymes, carotenoids and bioflavonoids — making it an antibacterial, antifungal and antiviral agent that strengthens the capillaries, reduces inflammation, stimulates the immune system and lowers cholesterol levels naturally.